AP Photo/Getty ImagesLaura Ingraham, a Fox News host, and David Hogg, a student at Marjory Stoneman Douglas High School in Parkland, Florida. 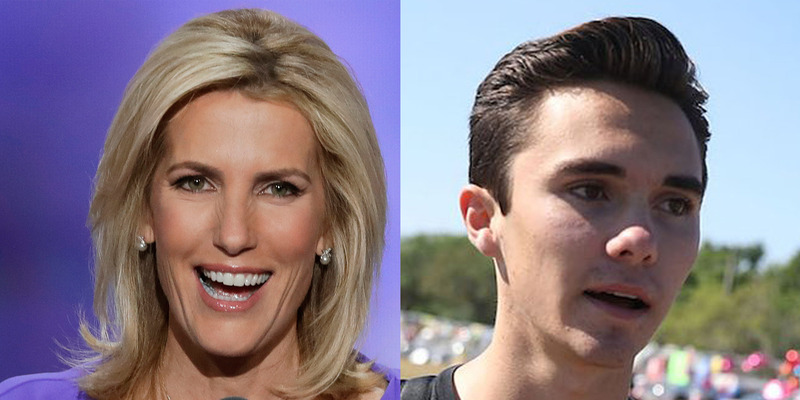 Laura Ingraham, a Fox News opinion-show host, made what some have interpreted as a snide comment about David Hogg, a student who survived the shooting last month at a high school in Parkland, Florida. Ingraham tweeted a link to a news article about Hogg having received some college rejection letters. She tweeted part of the article’s headline, “David Hogg Rejected By Four Colleges To Which He Applied,” and added “and whines about it” at the end. Hogg is now urging people to boycott Ingraham’s advertisers. David Hogg, a student who survived last month’s shooting at a high school in Parkland, Florida, who has become a prominent gun-control advocate, is now going after the advertisers of a conservative talk-show host who made light of his college rejection letters. Laura Ingraham, who hosts a Fox News opinion show, tweeted a link to a news article about Hogg having received rejection letters from several California schools. She included part of the article’s headline, “David Hogg Rejected By Four Colleges To Which He Applied,” and added “and whines about it” at the end. That tweet went out to Ingraham’s 2.2 million Twitter followers Wednesday morning and made its way back to Hogg nearly 10 hours later. “Soooo @IngrahamAngle what are your biggest advertisers … Asking for a friend,” Hogg tweeted, adding the hashtag #BoycottIngramAdverts. He later tweeted a list of companies he said were advertisers on Ingraham’s show and urged his followers to contact them. It was not immediately clear whether they were currently advertisers. The boycott call resembles previous campaigns that targeted the Fox hosts Sean Hannity and Bill O’Reilly, who was forced off the network amid a sexual-harassment scandal last year. Hogg is among other vocal survivors of gun violence who have been leading efforts to promote gun-regulation legislation since the February 14 shooting at Marjory Stoneman Douglas High School that left 17 people dead. Thousands of people flooded the streets in Washington, DC, and other cities over the weekend for the March for Our Lives, a largely student-led rally against gun violence.